Heather Terhune, executive chef at Tre Rivali in Milwaukee, started her career as a pastry chef. 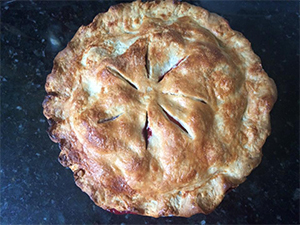 Along the way, she developed several techniques to perfect her pie crust. Most important is to chill the flour, fat, liquid and even the mixing bowl and blade prior to making the dough. Heat is the enemy and makes the dough tough rather than flaky, she says. And instead of mixing the ingredients with water, Terhune often uses chilled vodka as her liquid. The strawberries and rhubarb in this recipe are a sure sign of spring. 1. Prepare pastry dough and let rest at least 30 minutes. 2. Adjust oven rack to lowest position; place rimmed baking sheet on rack. Preheat oven to 500 F. Roll out half the pie dough and press into a 9-inch glass pie plate. 3. In large skillet, heat vegetable oil over medium heat. Add rhubarb and 1/4 cup sugar. Cook, stirring frequently, about 5 minutes or until rhubarb has lost most of its liquid but is still firm. 4. Transfer rhubarb to large plate; refrigerate until cool. 5. In large bowl, stir together cooled rhubarb, strawberries, lemon juice and vanilla extract. Stir in arrowroot and ¾ cup sugar until incorporated. Spread fruit mixture over unbaked pie crust. 6. Roll out remaining dough for top crust; lay over fruit and seal edges with fingers. Cut a few slits in top of pie to create vents. 7. In bowl, whisk together egg white and 1 tablespoon water to make the egg wash. Brush egg wash on top crust and sprinkle with sugar. 8. Place pie on heated baking sheet and immediately lower oven to 425 F. Bake 25 minutes, or until top crust is golden. Rotate baking sheet and reduce oven temperature to 375 F. Bake 30 to 35 minutes or until crust is a deep golden color and fruit is bubbling. Transfer pie to wire rack to cool before serving.